A broad sell-off in technology companies pulled U.S. stocks sharply lower Monday, knocking more than 600 points off the Dow Jones Industrial Average. The wave of selling snared big names, including Apple, Amazon and Goldman Sachs. Banks, consumer-focused companies, and media and communications stocks all took heavy losses. Crude oil prices fell, erasing early gains and extending a losing streak to 11 days. The tech stock tumble came followed an analyst report that suggested Apple significantly cut back orders from one of its suppliers. That, in turn, weighed on chipmakers. The market’s slide came after a two-week winning streak. The S&P 500 index dropped 54.79 points, or 2 percent, to 2,726.22. 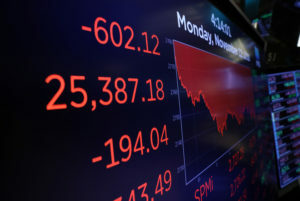 The Dow fell 602.12 points, or 2.3 percent, to 25,387.18. It was down briefly by 648 points. The Nasdaq composite slid 206.03 points, or 2.8 percent, to 7,200.87. The Russell 2000 index of smaller companies gave up 30.70 points, or 2 percent, to 1,518.79. Bond trading was closed for Veterans Day. Stocks in Europe also suffered losses. Apple tumbled 5 percent to $194.17 after Wells Fargo analysts said the iPhone maker is the unnamed customer that optical communications company Lumentum Holdings said was significantly reducing orders. Shares in Lumentum plunged 33 percent to $37.50. Several chipmakers also fell. Advanced Micro Devices gave up 9.5 percent to $19.03, while Nvidia lost 7.8 percent to $189.54. Micron Technology gave up 4.3 percent to $37.44. Amazon slid 4.4 percent to $1,636.85. Banks and other financial companies also took heavy losses Tuesday. Goldman Sachs slid 7.5 percent to $206.05. “Expectations are really that the deregulation process that has benefited banks up to this point is going to be slowed down with the Democrats in charge,” Bell said. Stocks appeared to have regained their footing after a skid in October snapped a six-month string of gains for the S&P 500. Stocks rallied last week after the U.S. midterm elections turned out largely as investors expected, with a divided Congress promising legislative gridlock in Washington the next couple of years. While the market has typically thrived in periods of divided government, investors continue to grapple with uncertainty over the U.S.-China trade dispute and the potential impact of increased oversight of Corporate America by Democrats, who will be taking over leadership in the House of Representatives in January. In addition, some companies have recently reported third-quarter earnings and outlooks that have stoked investors’ worries about the future growth of corporate profits. While companies got a boost this year from the lower tax rates put in place by President Donald Trump and the GOP last December, several companies have recently warned about the impact of higher costs related to tariffs and rising interest rates. British American Tobacco, which makes Newport cigarettes, plunged 8.8 percent to $38.08 on reports that regulators were considering a ban on menthol cigarettes. PG&E tumbled 17.4 percent to $32.98 after the electric utility told regulators that a high-voltage line experienced a problem near the origin of one of the major California wildfires before the blaze started. Investors bid up shares in Athenahealth after the struggling medical billing software maker said it received a $5.7 billion cash buyout offer. The stock jumped 9.7 percent to $131.97. About 90 percent of S&P 500 companies have reported third-quarter results so far, with some 51 percent of those posting earnings and revenue that topped Wall Street’s forecasts, according to S&P Global Market Intelligence. Several big retailers are due to deliver results this week, including Walmart, Home Depot, Williams-Sonoma, Nordstrom and J.C. Penney. Benchmark U.S. crude gave up an early gain, sliding 0.4 percent to settle at $59.93 per barrel in New York. Brent crude, used to price international oils, dipped 0.1 percent to close at $70.12 per barrel in London. Oil futures rose earlier on news that Saudi Arabia and other major producers planned to reduce output. The dollar strengthened to 113.86 yen from 113.80 yen on Friday. The euro fell to $1.1240 from $1.1336. The British pound weakened to $1.2853 from $1.2975 amid concerns that Britain’s government is struggling to find unity on a Brexit deal. Gold fell 0.4 percent to $1,203.50 an ounce. Silver lost 0.9 percent to $14.01 an ounce. Copper slid 0.3 percent to $2.68 a pound. In other energy trading, heating oil fell 0.8 percent to $2.16 a gallon and wholesale gasoline gained 0.9 percent to $1.64 a gallon. Natural gas rose 1.9 percent to $3.79 per 1,000 cubic feet. Major stock indexes in Europe also ended lower Monday. Germany’s DAX lost 1.8 percent and France’s CAC 40 fell 0.9 percent. Britain’s FTSE 100 shed 0.7 percent. In Asia, markets finished mixed. Japan’s Nikkei 225 added 0.1 percent, while Hong Kong’s Hang Seng rose 0.1 percent. Australia’s S&P-ASX 200 gained 0.3 percent. The Kospi in South Korea dipped 0.3 percent.